Whenever I’m asked, “How are your classes going?” my answer traditionally has been, “Ask the students.” As more faculty members shift their pedagogy to a student-centered learning, their focus must include not only delivering the content but also inviting students to explore the why of education. 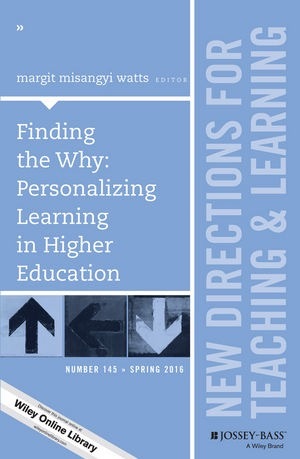 The articles in Finding the Why: Personalizing Learning in Higher Education edited by margit misangyi watts (sic), identify key ways to encourage students to discover the purpose of higher education as more than training for a career. While many of the articles describe institutional changes that have been developed to address the student success beyond the university, the principles behind such designs can be incorporated by individual faculty members in approaching how to present their courses’ content. One of the key principles is to encourage students to identify the applicability of a liberal-arts education to professional courses. One means by which this can be accomplished is described in “Integrative Learning: Making Liberal Education Purposeful, Personal, and Practical.” Ann Ferren and Chad Anderson describe several examples from various colleges that integrate learning across curricula and are adaptable even for larger institutions, such as designing opportunities for students to integrate curricula using collaborative projects, partnerships with the local community for service-learning, and making connections among disciplines. Furthermore, in “Project-Based Learning in Colleges of Business: Is It Enough to Develop Educated Graduates?” Penny Smith and Lindsey Gibbon note that business leaders are seeking qualities such as critical thinking skills, identifying and using creative problem solving, and communicating effectively. They note that “for business schools to graduate ‘well-educated’ students, they must forge and engage entire academic villages” (43) in preparing business students for their careers. 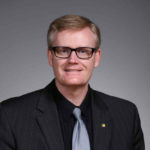 While many of the articles describe specific activities involving changes within the entire institution, such as integrative classes or designing a community college’s plan from its inception, the authors do challenge individual faculty to incorporate helping students find the why within their particular courses. The key to student success in many of the articles involves engaging students individually, not just collectively. Therefore, some of the strategies discussed can be applied by individual faculty on a smaller scale. While my answer to “How are your classes going?” may be the same, my intentionality within my course itself should have students answering in the positive. It shouldn’t be surprising that a volume intent on teaching students how to learn is just as intent on teaching the reader how to do just that, but it is still refreshing to read a book that lays out its goals, sticks to the promises it makes, and even creates its own study guide based on how much time the reader has to give to the text. 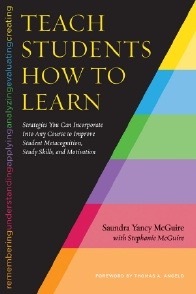 Well-structured and clear, Saundra Yancy McGuire’s Teach Students How to Learn is as thoughtful about itself as it is about the content it presents. 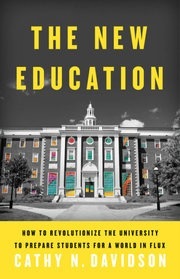 McGuire has composed this book to reflect her own response to and engagement with a pressing problem in higher education: namely, that many students, even those who qualify for admission at prestigious institutions, arrive without ever having been taught to learn by anything but rote memorization. Faced with college’s demands of skills higher in Bloom’s Taxonomy, they find themselves struggling and even failing. With this book McGuire gives teachers the tools they need to move their students past the high school model of retention until regurgitation, helping them instead to internalize a more nuanced, flexible understanding of learning. To convey this understanding, McGuire focuses on student mindset, encouraging educators to bring in everything from neurobiological models to fellow student success stories in order to help learners see that they are not stuck being “bad” at something – that change is not only possible, but already well within reach. One potentially significant drawback, depending on one’s perspective, is how the techniques are not out-of-the-box geared to address the concerns of humanities classes. Despite the fact that most of her experience comes from teaching chemistry – and how, relatedly, most of the examples in this book are from students of the sciences – McGuire insists that the techniques here are useful outside of STEM fields. While I have no difficulty believing that claim, it is clear that most of the methods in the book are geared toward content-focused disciplines. Fortunately, McGuire’s significant focus on critical and creative thinking on top of factual learning makes these strategies flexible and worth adapting. Most of all, McGuire is a fun writer. Personal and plainspoken, her style makes the pages fly by. (Any worries that this book might drown the reader in jargon should be alleviated by the appearance of the words “metacognition, schmetacognition” .) While perhaps not the most sophisticated text on the subject, Teaching Students How to Learn has hints and information appropriate to instructors at all levels of familiarity with metacognitive concepts, including none at all. I would recommend this book in particular to educators working with students from underserved communities, as giving students access to these techniques will help ensure their success far beyond the boundaries of a single classroom. The title Listening to Teach caught my eye. When one imagines teaching, one might first think the student’s job is to listen, while the teacher’s job is to speak, or at least to organize activities geared toward a predetermined outcome. What does listening have to do with the role of teaching? Furthermore, for those teaching within the religious academy, what might a pedagogy of listening look like in the context of religious higher education? Although this book does not specifically target religion or higher education, undergraduate and seminary professors will find many ideas, which will inspire their classroom teaching. The various models of pedagogical listening presented in this text can also serve to challenge traditional teaching strategies that are still pervasive in many higher education classrooms: teacher-centered strategies that often rely on a banking model where content is transferred to passive students. Infusing religion classrooms with dialogical and student-centered approaches can create new forms of learning where students learn not only content, but also how to ask good questions and seek answers in ways that are personally and contextually relevant. For many teachers this requires a shift in one’s perceived role: rather than seeing the teacher as having all the information and students as receptacles for it, this approach recognizes that students enter the classroom with a wealth of experiences and perspectives the teacher may not share. Within listening pedagogy models, teachers serve as co-researchers, observers and documenters of classroom interactions, and interpreters who can help students grasp the meaning of the learning that has taken place. As teachers listen deeply to students and encourage them to learn the art of listening to one another, students are able to enter into the learning process in a way that holds their interest and results in learning that remains in place far beyond a content test. Part 1 sparks ideas for teaching strategies and discussion formats that, although predominantly geared toward children, would work at least as effectively in a classroom of college or seminary students. In these methodologies there are some strategies I have come to through trial and error, but like many teachers in higher education, I have no formal training in teaching. Therefore, learning educational theories and strategies others have found helpful provides a deeper level of intentionality in my teaching, and allows me to see how I might more holistically implement options other than didactic teaching. These brief chapters also provide lists of references that are useful for digging more deeply into any of the specific pedagogies outlined. Part 2 contains ideas of particular relevance for higher education religion classrooms. 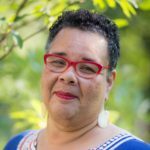 Chapter 8 focuses on a “pedagogy of discomfort,” which the author, Ashley Taylor, suggests as a way to approach teaching and learning about areas of injustice and oppression. Taylor draws together the cognitive and emotional aspects of learning, allowing learners to critically analyze their own emotional responses. A teacher’s role, then, is to listen intently to student responses and create a safe space in which to acknowledge and examine areas outside of our comfort zones. This approach could be quite helpful in facilitating conversations regarding the approach people of faith should take in the face of today’s many areas of social and economic inequity. Chapter 9 suggests a pedagogical model a religion teacher might find useful: curation as listening. Thinking of a religion teacher as a curator of a faith tradition, with particular emphasis on the Latin word curare, “to take care of,” what would it look like for religion professors to imagine our role as caring for the tradition and testimony of our spiritual forbears, closely listening to the voices (present and absent) in our tradition’s history, and the ways those voices speak to our present context? In content-based religion courses such as Bible, history, and some theology courses, how might the professor’s role shift by thinking of him or herself as a curator of the tradition rather than the all-knowing expert? How might the students’ experience change if they see themselves as co-curators, creating meaning alongside the tradition and their curator-professor? Other chapters also hold useful ideas, including the development of trust, the augmentation of uncertainty, and the ways that one transfers these listening pedagogies to an online format. Similar to the struggle experienced by many K-12 teachers regarding “teaching to the test,” many religion professors may wonder if students can learn an appropriate level of content based on these methodologies, and this is a valid critique. Engaging a pedagogy of listening invites academics to reimagine ways by which a discipline is passed on most effectively and meaningfully. For those recognizing the limitations of the banking model of education, pedagogies of listening offer alternative models to advance lifelong student learning. “Teachers are like new parents,” Cari Crumly asserts. “[T]hey don’t want to be told how to raise their children or, in this case, how to teach their students. Yet, sometimes, even the least-experienced teacher can introduce new methods that engage, encourage, and promote motivation and participation among students” (4). 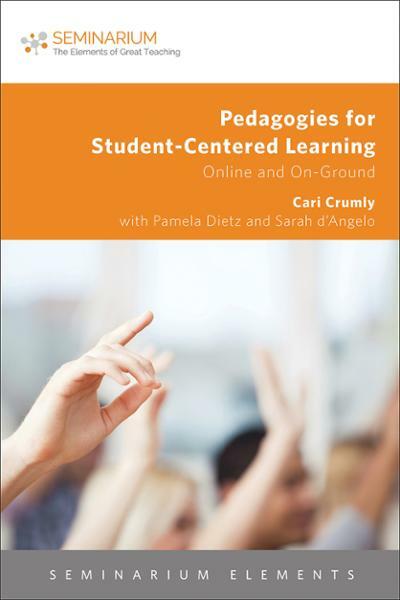 Crumly lays down the gauntlet repeatedly in this book: “student-centered learning will revolutionize your classroom and reinvigorate your career” (5). As Crumly notes, “student-centered learning is a learning model placing the learner in the center of the learning process. Students are active participants in their learning, learning at their own pace and using their own strategies; they are more intrinsically than extrinsically motivated; and learning is more individualized than standardized” (4). Certainly there are situations in which (and learners for whom) more external structure is appropriate, but Crumly makes a very persuasive case for those being the exception rather than the rule. The good news is that if you are a teacher-centered professor, Pedagogies for Student-Centered Learning gives you everything you need to make changes in your teaching. There is an historical timeline to remind readers that student-centered learning is not a new fad; it’s been with us for centuries. There is a section on teacher-centered classrooms, so we can check whether we are (or are not) as student-centered as we’d like to think we are. There is information on understanding your learning population. There are examples from real classrooms about how student-centered learning can play out, and how it benefits students. Each chapter contains questions for investigation. There is also a list of instructional tactics, with commonly used exercises and the advantages of using each one. Appendices and URLs point readers to even more resources, and Pamela Dietz adds a section on how to bring faculty, administrators, and tech support on board. If you are a visual learner, there are a number of graphical elements that will assist in your assimilation of the material presented. Fortress Press’s new Seminarium: The Elements of Great Teaching series is ideal for twenty-first-century readers. QR codes dot the pages – but don’t worry, if you don’t do QR codes, the URLs are available in footnotes. This book is full of great, useful information – and points readers to more useful information online. Certainly, there are some distractions (for example, misrepresentations of quotations from other thinkers at times). Definitions of student-centered learning can become repetitive over the course of the book. And Sarah d’Angelo’s chapter on student-centered learning in a theater classroom contains a bit more information than is likely to be useful for religious-studies and seminary faculty. But none of these detracts from the benefits of the book as a whole. I have been reviewing books on teaching for ten years or more – this is easily one of the most helpful books I have ever reviewed, and one to which I will return often. I have attempted student-centered learning in a number of courses and contexts; it can be very hard to pull off successfully, and does require a rethinking of our role as faculty. While Crumly suggests that “The student-centered classroom, whether on ground or online, is characterized by individualization, interaction, and integration,” I did wonder how this might work in an online environment (10). I look forward to further exploring these possibilities.